In the US at least, every subscriber to T-Mobile’s prepaid service gets free access to the mobile web. Before you get too excited I have to point out that it’s a walled garden and a very small one at that. In the garden you can find the usual pricey carrier downloadable games and ringtones, view your plan’s prepaid balance and expiration date and add money to the account. At one time, before T-Mobile offered any prepaid data plans, they gave prepaid users unlimited access to seven off-portal sites at no charge – and they weren’t bad sites either. ABC News was linked directly from the phone’s default homepage and CNN, ESPN and many more would work if you type in the URL. Someone has created a mobile portal at fast-mobile.com that links to all the currently known free sites. Fast-Mobile.com and the free sites it links to work with any browser that can connect through a WAP gateway or directly to the Internet, including Opera Mobile and the built in browsers of most phones. It doesn’t work with proxy based browsers like Opera Mini, Bolt or the UC Browser. Except for wml sites it also works with the Safari Browser of unlocked iPhones. Free T-Zones doesn’t work with proxy based browsers like Opera Mini, Bolt or the UC Browser because access to the proxies is blocked. It also doesn’t work with the Android phones sold by T-Mobile and the Google Developer phones all of which are explicitly blocked from free T-Zones. It’s really pretty cool that T-Mobile is giving away a subset of mobile web for free to prepaid users. I don’t know what T-Mobile’s goal is with free T-Zones. It’s probably just a loophole caused by a misconfigured firewall. But it does provide a no-risk introduction to mobile browsing – creating awareness and buzz among pre-paid customers. This entry was posted in Carriers and tagged free mobile web, mobile web tips and tricks, T-Mobile by Dennis Bournique. Bookmark the permalink. Hi ,I like to know that still prepaid free mobile web is accessible.? Still APN as “wap.myvoicestream.com” good? Thank you, Mr. Bournique for quick reply.I tried with AT&T Samsung galaxy s captivate Android phone with wap.myvoicestream.com with GPRS settings and i could not get any data.That means you cant use any Android phone? T-Mobile Android phones are blocked from the free sites. At one time non-T-Mobile Android phones worked but it sounds like they are blocked too. My Symbian Nokia N8 still works. Thank you, Mr. Bournique. Just happened upon this site and found the information quite useful. 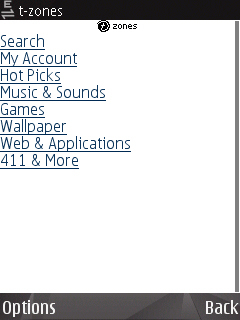 The navigation links on fast-mobile.com did not work on my Nokia E63, but I manually entered the links for the “free sites” that worked and bookmarked them. Trying this with the 10 cent pay as you go plan on a non-smartphone with broswer c3050. If I place in the proxy (WAP IP and port) I’ll get a network error without the proxy I get the page to pay for a webpass. What is wrong? Change the Access Point Name to wap.voicestream.com, leave WAP IP and port blank and then go to http://fast-mobile.com It’s still working for me. What do you mean by “free” internet? Does that mean it doesn’t subtract data from my 30 mB monthly allowance? If so, How do I set it up on a Nokia E73? This would save me from the daypass that might come up at the end of a month. This workaround is only for users who have prepaid without any data plan. You mention 30MB data allowance, so it’s not for you. As explained in the post it’s free access to a limited number of sites which are listed at http://fast-mobile.com. With the $30 T-Mobile Prepaid Monthly Plan usage who still subtract from the 30 MB allowance, but I believe (but haven’t tested) that you could access the free sites after your 30 MB was used up without a day pass. There definitely has been some cutbacks, but you can still reasonably do some things for free. Yahoo stopped working for me some time late last year. Nothing else seems to work either at this point. Sigh. I just got an Nokia E71, using it on TMobile prepaid. I was hoping to get free Yahoo mail, but it seems to be blocked. ABC News is available as the article points out from the menu directly. For me, in Texas, the yahoo access stopped working about a month ago. BBC News still works though. Thanks for posting this info, we are all very appreciative for your effort! I have ATT and a sim card in the phone, I want to use my new smartphone from China with the sim card in the phone that has wifi capabilities to just access the free wifi when it is detected or available without using any data plan or getting charges from ATT to access the web. How can I do this? What wap can I use? What configurations on the phone do I need? How can I do this, using the wifi on the phone to access the web when there is wifi available with out using any of my data plan with ATT? Check it out on your mobile phone for free internet. Also click on the “Galaxy Browser” to type in your own website URL to view it free! It sounds like something is misconfigured on T-Mobile’s end. ABC News and Yahoo both work on my Nokia N95. ABC News should definitely work as it’s an advertised feature. I’d try calling T-Mobile to see if they can fix it. I now tried and couldn’t get anywhere beyond the home page. Even the ABC News link did not connect. One corner that needs help – I can get to m.yahoo.com and see my mail. However, sending mail from Yahoo requires filling in a CAPTCHA which shows up as a broken image. I tried to look at the web page source code but did not succeed in determining whether the issue is that the CAPTCHA is imported from another domain. Any ideas how to send mail from yahoo using this scheme? When I send email with Yahoo I don’t see anything about entering CAPTCHA values. Maybe Yahoo thinks your account is compromised. Try logging out of Yahoo and logging back in. Thanks, but I confirmed that I get the CAPTCHA when sending from m.yahoo.com on my desktop computer. I’ll try and set up a new account. I performed the CAPTCHA from the desktop computer, and Yahoo then did not ask me for CAPTCHA on a second send attempt. It seems CAPTCHA is only asked once per account? I’ll try from my phone next! Hey, I have T-mobile TOGO SIM and WinMo Smart phone and I run Skype without any trouble on TMO network… have anyone knows how that happenes? Is it normal or my data settings are “special”? Can any body else try using skype on TMO TOGO for the purpose of establishing the right settings for everyone who wants to do it. I would like to try, I have HTC Tilt running 6.5. I recently found out that I can get emails from my gmail account using MS Exchange Server, that made my day. Now your information might make my week. I tried it and it didn’t work. Can you provide more details so that we can figure out the settings. From the home page you should have access to CNN, ESPN and ABC News. You can get to the other sites I mentioned by entering their URLs (except Radar.net which no longer seems to be available). Phone: HTC Ozone – Verizon Wireless phone activeted for Page Plus Cellular with unlocked SIM card support, I have a TMO TOGO sim card there. I do not know if the second proxy plays any role in running Skype but who knows. im using an iphone and i get free skype along with free ms exchange email/calendar/contact sync and i get free google mail/calander/voice/ over safari and i get free google voice using the jailbreak google voice app. also the espn app works and for awhile my yahoo app worked as well. this is a great deal since i dont need to get a data plan. if skype calling was over 3g rather then EDGE then i probably wouldn’t even use any phone minutes. hell i hardly use phone minutes anyway since im only on the $1/day plan and i use my phone after 7p. im thinking of gettin a nokia n900 as my next phone and that is partly to see if i get free skype on that as well and i can utilize full 3g with that phone since it has tmobile’s 3g bands. one thing people need to keep in mind is i lost everything (skype, exchange, google etc) when i swapped my sim onto another phone and then back to my iphone. changing apns didn’t help either. it was only until i went from a simplemobile sim on my iphone for a month and then back to my tmo sim that i regained all that. so if you dont want to lose all that stuff dont swap your sim. The Storm is a Verizon exclusive in the US. Nobody knows when or if it will be available om T-Mobile. Supposedly you can unlock the Verizon Storm and use it on T-Mobile but it doesn’t have T-Mobile’s 3G bands so you will only get Edge. When will tmobile start selling the blackberry storm? YOU CAN GO TO OTHER WEBSITES TOO, T-MOBILE’S MAIN SITE BEING ONE OF THEM! Found this site by accident. Iphonefan I did your process, and it works perfectly! BTW you can also access m.yahoo.com too!!! Thanks for the info. If you are using your iphone on a T-Mobile PrePaid acount already the all you have to do is install the T-Zone Hack from the BigBoss repository and change the APN to wap.voicestream.com. T-Mobile should take a page from AT&T’s GoPhone playbook and offer a cheap unlimited data plan for their prepaid subscribers. Something like $15-20/month charged directly to a credit or debit card. In India,situation is startingly amazing.Vodafone and Idea cellular offer free browsing (they charge for downloading anything that is not a webpage,however).Airtel offers a $32 per year unlimited data access (It is really unlimited without any per month data barrier).Tata indicom offers free walled-garden browsing but this walled-garden is definitely much bigger than that of T-Mobile.Back in 2007,Airtel offered an exclusive free unlimited mobile access on its Lifetime connection.I am using one such connection.Although it is EGPRS (3G going to debut next year),it is still pretty cool when you have nothing to pay.